There’s nothing quite as delicious as some of the classic pies. I found a hundred-year old recipe for Lemon Creme Pie – more commonly known as Lemon Meringue Pie – in a small promotional cookbook published by the Calumet Baking Powder Company. The accompanying picture brought back memories of delectable pies made by my grandmother and great aunts at family gatherings – and I immediately knew that I needed to try it. The lemon juice and grated lemon peel combine beautifully with the other ingredients to create a refreshingly tart pie covered with billows of light, slightly sweet meringue. This recipe is definitely a keeper. Preheat oven to 350° F. Combine sugar and flour in a mixing bowl, then stir in egg yolks. Add 1/2 cup lemon juice, grated lemon, and water; beat until smooth. Put mixture into a saucepan; bring to a boil using medium heat while stirring constantly. When the mixture begins to boil, reduce heat and continue cooking for 1 minute or until it thickens. Put filling into the pie shell. To prepare the meringue, put the egg whites into a mixing bowl. Beat until stiff peaks form, then beat in the powdered sugar and 1 tablespoon lemon juice. Spoon the meringue onto the top of the pie, and then swirl. Bake in the oven for approximately 10 minutes or until the meringue is a light brown. Posted on April 9, 2016 April 9, 2016 by SherylPosted in FoodTagged lemon, pie. Stop it! I’m getting too many sugar highs from reading your blogs. But oh my, how yummy. 🙂 Sorry, next week I’ll have to post something other than a dessert. . . but at least you’re not ruining your diet by virtually enjoying the pie. Lemon pie is my favorite, I think. And, I just happen to have three pints of Myer lemon juice in the freezer, waiting for an occasion. I believe the occasion has come! Since swaps always are fun, here’s my very favorite lemon pie. It’s called “Mile High Lemon Chiffon Pie,” and it was a specialty at Stone’s restaurant in Marshalltown, Iowa, when I was growing up. Because it’s so light, it’s a wonderful summer dessert. Oh, it’s good. I’ll probably have to make them both. Thanks for sharing the Mile High Lemon Chiffon Pie. Recipes from restaurants for their most popular dishes are the best. I see that the Mile High recipes includes gelatin. That would make the filling a little thicker than the recipe I posted–and the pie slices would probably hold their shape very well in warmer weather, when sitting a long time, etc. 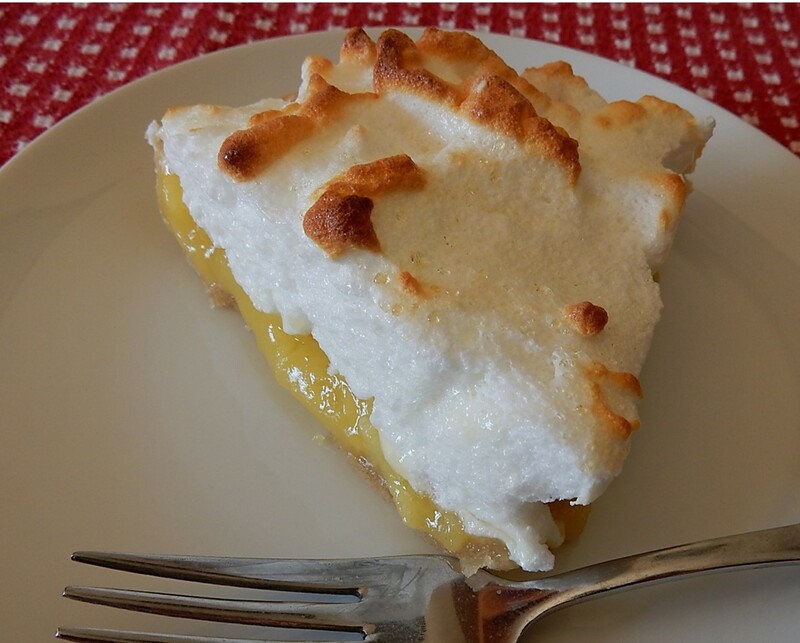 My grandmother always made lemon meringue pie. It was the best! Yes and I don’t think I have had a lemon meringue pie since my grandmother stopped making them. Need to get on that. Wow, it’s wonderful that the CWA has been active for so many years. It must be so much fun to look through their cookbooks across the years, and see what foods and cooking methods were popular during different time periods. My favourite kind of pie! Oh I love a lemon meringue pie! Made a many of these 🙂 only I would put the oven on broil for to brown the meringue, had to watch closely so not to burn it. Lemon meringue pie is one of my favorites—especially in the Spring! I just researched Calumet Baking Powder Co (I thought they might have been based in Calumet, OK, which is close to me); they were a company operating in Chicago and got their start in 1889. Apparently Calumet is a word for a Native American ceremonial pipe. Thanks for sharing the link. It’s amazing how grandmothers around the world all seemed to know how to make Lemon Meringue Pie. 🙂 Your grandmother’s recipe sounds wonderful. I like how it is almost a cross between a pie and a cheesecake. Lemon pie is one of my favorites, and yours looks tempting. I have to ask the question — why was this recipe in a book put out by a baking powder company? There is no baking powder in it. You made me curious, so I looked it up. The pastry recipe called for baking powder. Interspersed in the cookbook were tidbits of information for the cook, and one indicated that it took an experienced cook to make good pastry without baking powder. Their recipe called for, of course, Calumet baking powder. I suspect it was mainly marketing–you know, that comment about cooks “with a heavy rolling pin” making tough pastry and what talent it took to make light and airy pastry and that most ordinary cooks did not have that ability. Now granted, my maternal grandmother could make a pie crust to defy awesome, and my paternal grandmother was the heavy rolling pin queen with something that tasted akin to lard and flour play-doh and could have been used to patch concrete. To my best recollection, baking powder has never been used in the pie crusts made on the maternal side and to this day yield the tender and flaky results, and clearly, baking powder was not used in Grandma’s pastry either. 🙂 I think I see some research coming on! I think that you and I are both researchers at heart. 🙂 I love your description, and comparison. The next time I make a pie crust that doesn’t turn out quite right I’ll blame it on my heavy rolling pin. My mother used to always say that it was important to use ice cold water keep keep it tender. It was something about pie dough getting tough if the fat from melting before baking. Thanks for satisfying my curiosity. I’ve never added baking powder to pastry!! It sounds somewhat subversive. I think that a number of food companies back then were trying to create general cookbooks and included some recipes that did not include ingredients manufactured by the company. (It’s similar to how General Mills a little later in the century created the Betty Crocker Cookbook which includes a wide range of recipes that do not call for ingredients manufactured by General Mills). Pie paste. Sounds like something that is going to stick to you whether you want it to or not. I might drop the e and put it in the past. Ha, it sounds like I was right about Grandma’s pie paste could have been used to patch concrete! My grandmother made this, too, and banana cream and coconut cream. Oh, yum–such excellent memories! I have a lot of fun doing this blog, and it’s wonderful to hear that this post brought back some good memories. The lemon meringue pie, one of my favorites and I enjoy making it. I love lemon meringue pie, and I think I can manage this recipe, too. Thanks for sharing it! I don’t think that you’d have any problems with this recipe. I labeled it as having medium difficulty because it involves a number of steps and components (pie shell, filling, meringue), but everything went very smoothly when I made it. Strange. . I wonder what went wrong with your recipe. Yum! My mouth is literally watering right now. So fun to see that some classic recipes have really stood the test of time! Looks perfect! It is interesting how some recipes are fads that come and go –whereas others like Lemon Meringue Pie are classics that never go out of style. Thank you! It did turn out to be a very nice looking pie. You’re welcome. It’s nice to hear that you liked this post. My mother made a great lemon meringue pie but I never got her recipe. Recently I found one online and tried it. Turned out great and was similar to your recipe. I found comments about baking powder for the crusts interesting as I have never used that for my crust. My recipe calls for cold water and seems to work. It is really intriguing how the old recipe called for baking powder. It seems like the crust would have a different consistency if it was used. . . puffier? . . . airier? . . . more cake-like? I made this lovely pie yesterday afternoon & its as fun making it in my kitchen! So delightful too! It’s wonderful t hear that you liked this recipe. One of my favorite pies, as a matter of fact it is the only one I remember my mother making. Memories of lemon meringue pies and mothers (and grandmothers) just go together. They are such a wonderful old-fashioned classic. I can almost taste it–delicious! Your meringue looks perfect. Yum! I was pleased with how it turned out. I love lemon and lemon meringue pie. I have never made meringue before. You should try making meringue sometime. It is fun to make. Lovely!! This is my favourite dessert! Brings back memories for me too! Yep,they sure are! Brings back memories of being at the South Bank, waiting to see a show, with a pot of tea and a whole lemon meringue pie.. I was only 5-6 years old at the time. Such a treat!